I think the Irish American community should accept Mayor Bloomberg's apology for his comments on the inebriated Irish but I am still baffled as to why he said them. I was there for the comments made at the American Irish Historical Society, (pictured) and was first to report them, but a day later they still intrigue me. The story went viral because what Bloomberg said seemed so off the wall. He said that usually when he walks by the building "there are a bunch of people that are totally inebriated hanging out the window waving"
Bloomberg conjured up a vision of inebriated Irish people hanging from windows, drunkenly cheering on the St.Patrick's Parade as it passes. If you knew the AIHS as it is known, you know the likelihood of that happening is about the same as Hosni Mubarak being elected next president of Egypt. 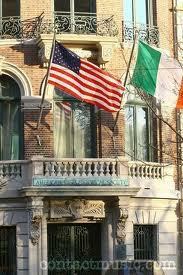 It is a beautiful Fifth Avenue mansion, a center of culture, history and learning, the closest the Irish in America have to a national library with a treasure trove of artifacts and historical documents that set it apart. The programs offered are usual classical music, learned Irish writers, poets and academic lectures. I have been to several AIHS St.Patrick's Day events as I am on the board and I can assure you there were no drunks screaming or hanging from the windowsills. If anything the atmosphere is a little too subdued for St.Patrick's Day and where Bloomberg got the notion that hijinks were regularly happening escapes me. Even in as smart a man as Bloomberg, the tendency to stereotype slips out ,he could not let the celebration of a book launch about the St. Patrick's Day Parade pass without a pointless wisecrack that came over like a skunk at a garden party. The person I was standing beside turned to me and asked 'Did he just say that?' when he made the comments. Bloomberg was standing in the greatest Irish building in the United States, just renovated at a cost of $6 million, a home of Irish learning and culture and all he could come up with was a lame drinking stereotype. Is that what he thinks the Irish are really about ? It was not good enough for this mayor or for Irish Americans to give him a pass. Quite rightly he has now apologized and there the matter rests.